Some people consider it to be less natural looking. There are many burrowing fish and invertebrates that should not be kept in a bare bottom tank. Some people will put sand in a shallow container for these creatures, but these often become stagnant. 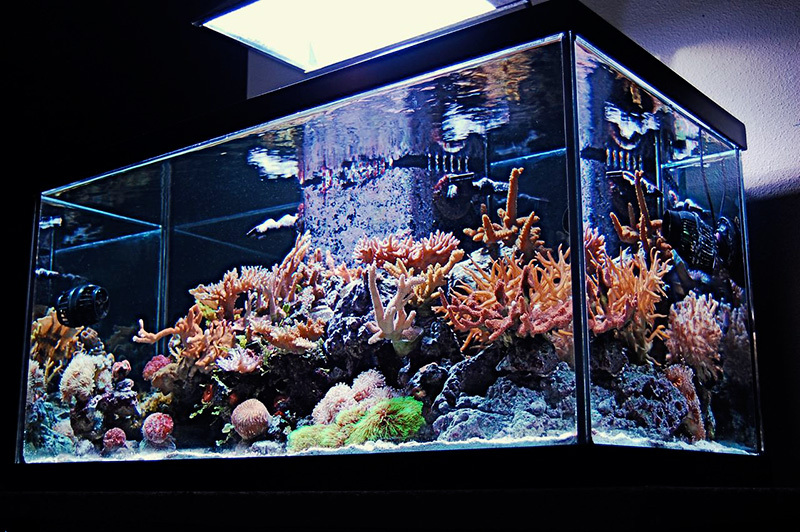 You will not have the benefit of sand-dwelling microorganisms, but this can be achieved by incorporating a refugium with a sand bed into the system. Care must be taken to make sure rockwork is carefully placed and secured. Just as with tanks with black substrate, bare bottom tanks can appear darker than tanks with a light colored substrate. It saves money on sand which can be quite expensive on larger tanks. It is easier to vacuum up uneaten food, fish waste, and other detritus that has settled to the bottom. Allows you to aim powerheads and other sources of water movement in any direction desired to maximize water flow throughout the system and behind rockwork without sand to disturb. With bare bottom tanks, you want to direct more flow to the bottom to push detritus into the water column where it can be filtered out. There is less chance of developing cyanobacteria (red slime) due to low flow near the sand bed that is common in tanks with a substrate.